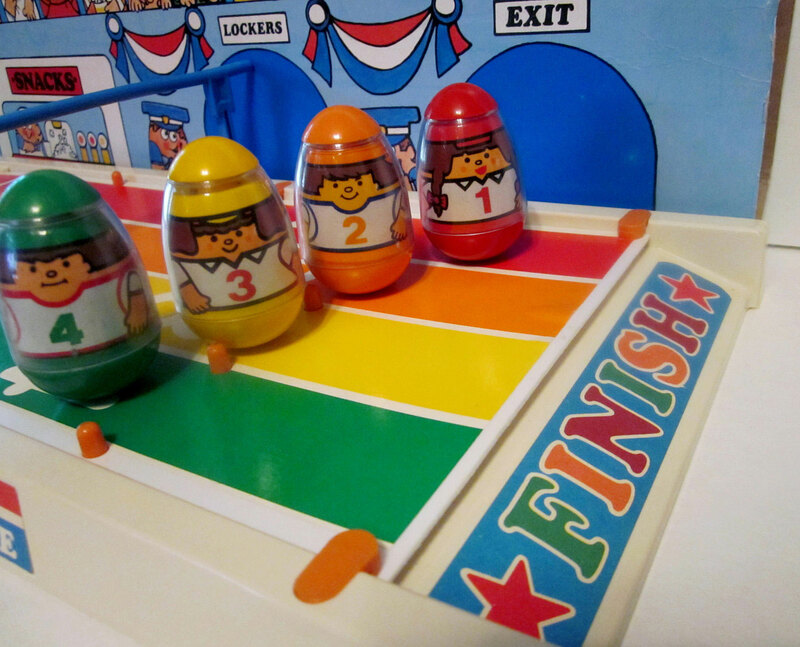 Description: Place the 4 Weeble racer figures on the race track starting line, turn the crank, and watch the Weebles Wobble down the race track. Racers have to watch out for obsticles and bend under the hurtle. 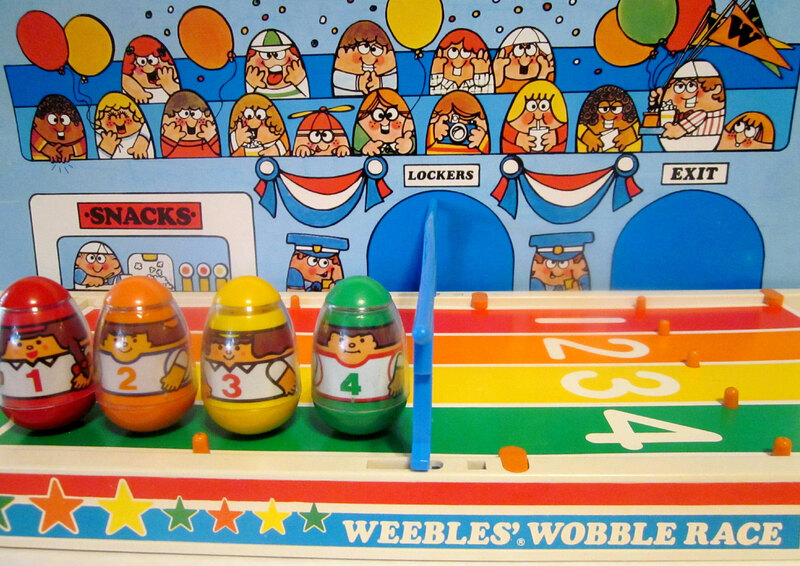 The race has an attached "grandstand" with 2 rows of Weeble race fans in the "seats". 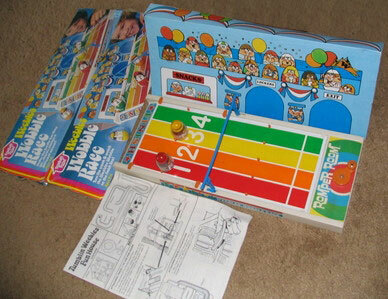 Weeble' Wobble Race Track: HTW323 - White rectangular race track with 4 lanes on top (red, orange, yellow, green). Each lane is marked with a white number (red-1, orange-2, yellow-3, green-4). The end of the track has a small ramp with a litho marked "finish". 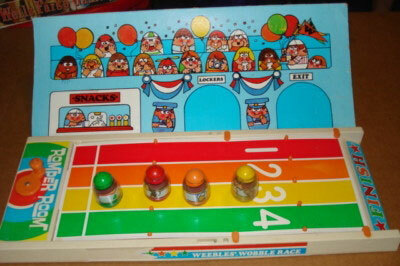 The front end of the track has a orange hand crank (makes Weebles wobble down the track when crank is turned. Grandstand - HTW325 - Large light blue cardboard grandstand featuring a snacks stand, 2 dark blue arched doorways (one marked Lockers", other marked "Exit" with a Weeble police officer by each door. Top half has 2 rows of Weebles race fans in the seats. HTW38 - Racer 1 - Red base, red top with brown hair (2 braids) and a white shirt marked "1" in red on the front. HTW39 - Racer 2 - Orange base, orange top with brown hair and a white shirt marked "2" in orange on the front. HTW40 - Racer 3 - Yellow base, yellow top with brown hair and a white shirt marked "3" in red on the front. HTW41 - Racer 4 - Green base, green top with brown hair and a white shirt marked "4" in green on the front.